Need: 1 broccoli crown, ginger root, minced garlic, 2 chicken thighs, soy sauce, teriyaki, cracked pepper, rice, 3 large carrots, sherry cooking wine, and sesame oil. If you have a rice cooker, get that started first. Clean and chop carrots how you like. Cut up broccoli into spears. Slice chicken into chunks. In a fry pan, grease with sesame oil. When up to medium low heat, throw on chicken, crack some pepper on the meat. Steam carrots first until nearly done, then throw on the broccoli. While the carrots cook, the chicken should be about half way done, add soy, teriyaki and sherry to make sauce. Shave 1-2 tsp fresh ginger (or frozen). Add mince garlic to chicken. Let it cook in the soy-teriyaki-wine sauce. Turn down to low to finish. Throw ginger on the chicken, stir. Carrots should nearly ready, add broccoli to steamer. Turn off the chicken burner and let the meat soak up the sauce. 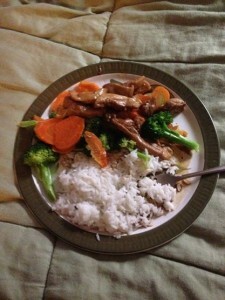 When the broccoli is done, plate how much rice you want, put vegetables alongside, pour sauce and chicken on vegetables.